Can your website handle an epic spike in traffic? When a personal finance application with 4,000 users started a partnership with H&R Block, they had to prepare their website for more traffic. And they had to do it fast. They turned to PointClick for help. The business called Budget Challenge, went from 4,000 customers to 200,000 over the course of one summer. Because PointClick was able to optimize their DNN application, the businesses' growth exceeded everyone's expectations. How PointClick took a sluggish website from last to fast. What tools identified stress points when traffic increased. Who helped them achieve what the client thought was unattainable. 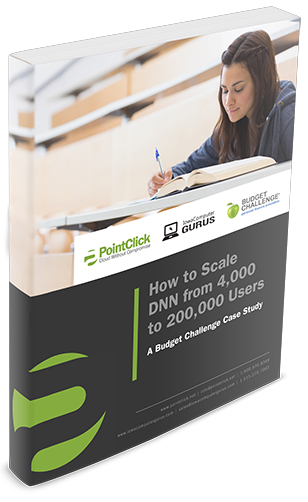 Fill out the form and download How to Scale DNN from 4,000 to 200,000 Users a Budget Challenge Case Study now.